RoRo access/transfer equipment for the operator's latest car/passenger tonnage commitments. Each shipset will hold two stern ramp/doors, a hoistable deck access ramp, a side-hinged ramp cover and hydraulic system including power packs. Military Sealift Command (MSC) has chosen Autoship Systems' onboard sta- bility program Autoload for their ves- sels. Autoload allows vessel operators to perform proper trim stability and strength calculations for any load calcu- lations for any load condition before departing port and at anytime while at sea. Based on Autoship's Autohydro hydrostatic engine, Autoload calculates stability and strength as fuel and con- sumables are used, helps optimize bal- last, and evaluates strength and stability in a damaged or grounded condition. National Steel and Shipbuilding Com- pany (NASSCO), a General Dynamics company, has delivered the 950 ft. (289.5 m) Red Cloud to the U.S. Navy. Sealift Program, Red Cloud was com- pleted under target cost and was deliv- ered to the Navy three months ahead of schedule. The vessel was delivered under NASSCO's single Integrated Trial concept, a process that aids in cost reduction and accelerated delivery. U.S. Navy's Military Sealift Command, carrying prepositioned U.S. Army equipment, vehicles and supplies near potential areas of conflict around the world. The Siemens-Schottel Propulsor Con- sortium (SSP) has received an order for the provision of an SSP pod drive and the electrical systems for the Italian cruise ship M.V. Costa Classica. The $78.8 million project, known as the largest modernization of a cruise ship to date, also encompasses the vessel's lengthening of 147 ft. (44.8 m), and will have its superstructure heightened with the addition of one new deck. The ves- sel, which was built in 1991 by Fin- cantieri, weighs 52,926-gt. Since the existing diesel direct CP pro- peller system with a power rating of 10.5 MW per shaft was kept, the SSP will be implemented as a supplementary drive in the center, behind the rudder blades. Not only will this new system achieve the goal of raising the vessel's speed to about 23 knots, it will also pro- vide higher maneuverability since the pod can be rotated about its verti- cal axis. Costa Classica will undergo a $78.8M refurbishment, including the addition of a Siemens-Schottel Propulsor and a 147-ft. (44.8 m) lengthening. New reduced rates from the middle of the ocean. 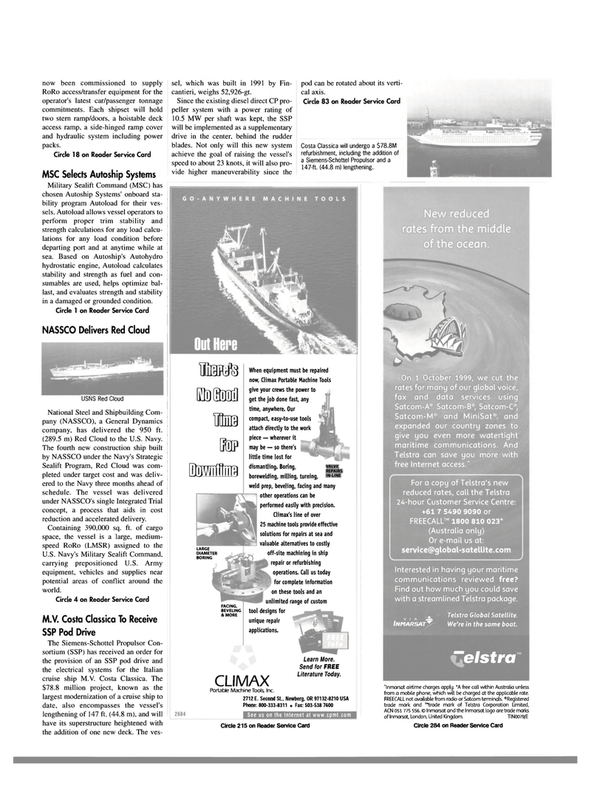 Interested in having your maritime communications reviewed free? Find out how much you could save with a streamlined Telstra package. We're in the same boat. ~elstra "Inmarsat airtime charges apply. *A free call within Australia unless from a mobile phone, which will be charged at the applicable rate. When equipment must be repaired now, Climax Portable Machine Tools give your crews the power to get the job done fast, any time, anywhere. Our compact, easy-to-use tools attach directly to the work piece — wherever it may be — so there's little time lost for dismantling. Boring, borewelding, milling, turning, weld prep, beveling, faring and many other operations can be performed easily with precision. Climax's line of over 25 machine tools provide effective solutions for repairs at sea and valuable alternatives to costly off-site machining in ship repair or refurbishing operations. Call us today for complete information on these tools and an unlimited range of custom tool designs for unique repair applications.